For the past weeks I had the pleasure to test the new Bonhoff IP-3.0. I took it to Baselworld, and to watchcollector meetings. I can tell you a few things that I heard from people. Well, it is a watch. A watch that requires your participation in order to read the time. Well, you need to use the bezel. Turn the bezel left or right to match the two small circles to read the hour and the two large circles to read the minutes. There is no seconds indication on the watch. So it is kind of “slomo”… slow motion… decelerated time reading. 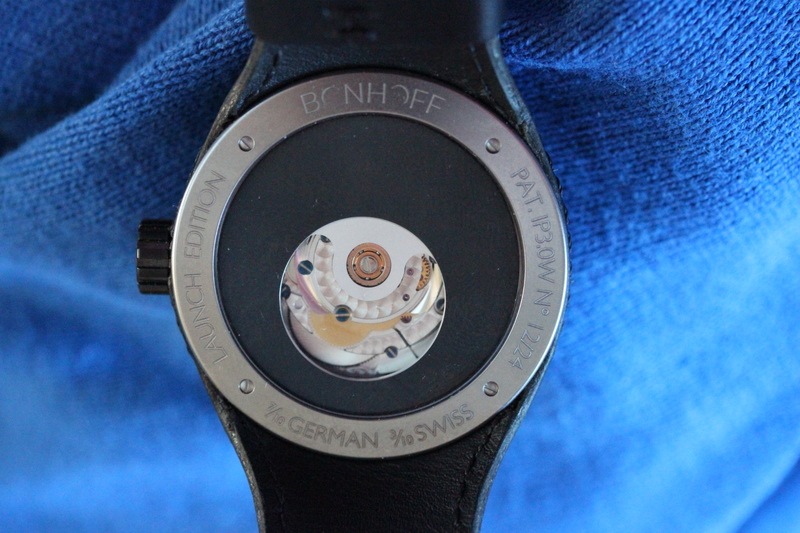 Hannes Bonhoff is a mechanical engineer from Germany. 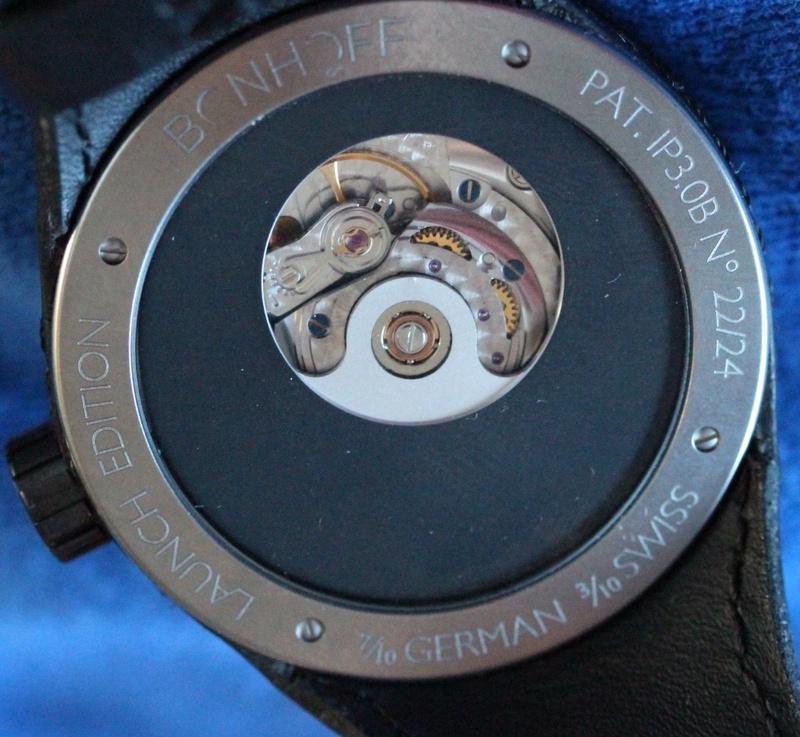 He designed and created this watch using solely German and Swiss parts. Since the advent of quartz watches and today smartphones, the mechanical watch has evolved beyond its initial sole purpose of keeping time. The Bonhoff IP3.0 pays tribute to this evolution and offers an interactive time display with a fully integrated leather strap in the four-figure price range. 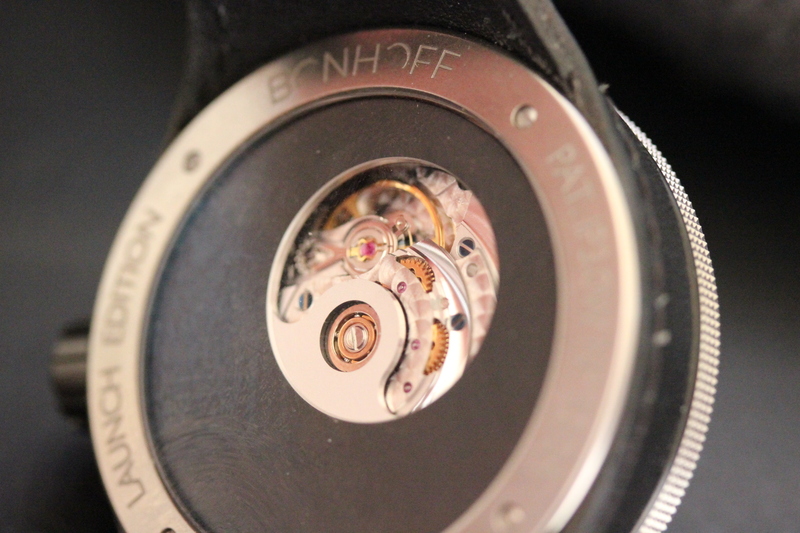 The patented display system consists of eight layers including five sapphire discs, yet does not require a modification of the movement. 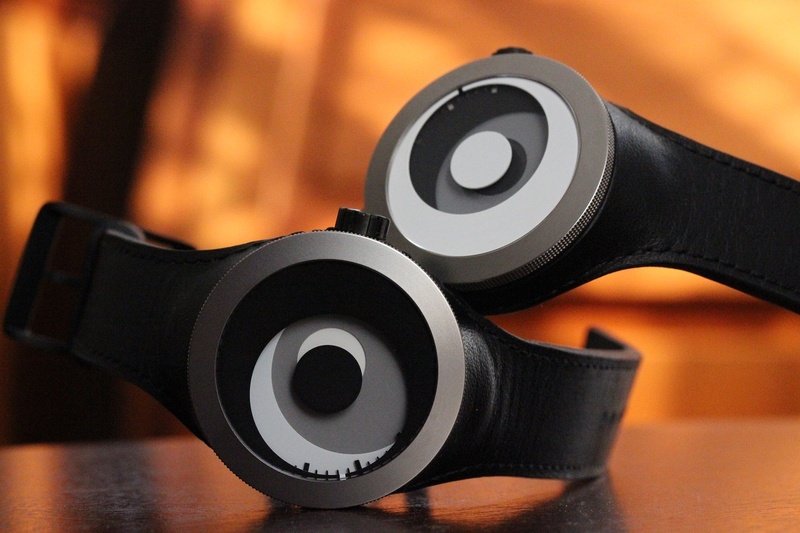 The time is revealed by turning the bezel to align the circles of the display. 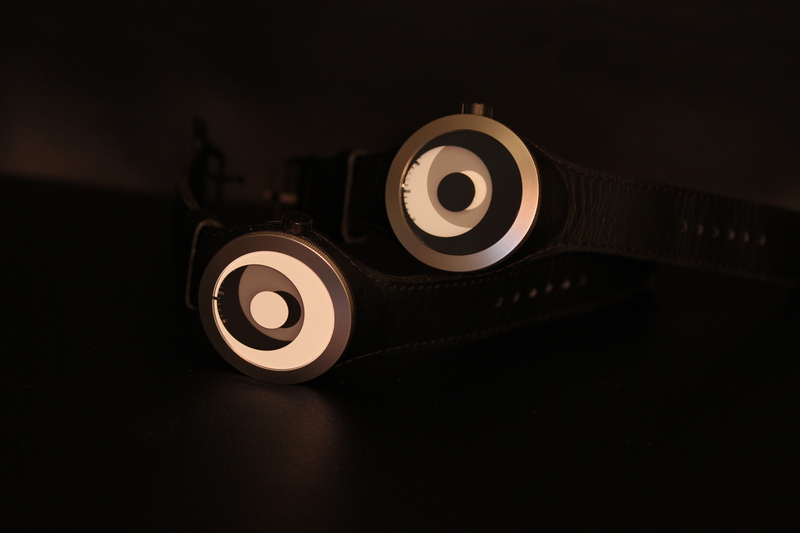 In analogy with the conventional time display, the large circles represent the minute and the small circles the hour. The minutes are read by turning the bezel in order to have the large circles match and the hour is read when the small circles are matched. The drawing of the case shows the eight layers of the patented display system. The top black disc is sandwiched between two sapphires sitting in the bezel. Then comes the case front sapphire followed by index ring above the minute and hour sapphire discs and the dial underneath. The sixth sapphire sits on the case back. That amounts to a total of 12 anti-reflective coatings with the two outer surfaces treated with the industry standard hard coating for increased scratch resistance. As conventional lugs would obstruct the fingers when rotating the bezel, the patented strap construction features a seamless transition to the case, except with seams leading around the case. Instead of using lugs, a single piece of leather hugs the watch creating smooth curvatures that please the fingers when turning the bezel. The resulting 3D shape has the additional advantages that the watch is more firmly fixed on the wrist and that the watch wears smaller allowing for a bigger case and display. A single thread with a length of two meters is stitched by hand along the sides of the leather which alone takes around one hour to do. With the double case back the strap can easily be replaced without having to expose the movement. With a focus on large and elemental shapes, the Bonhoff IP3.0B is designed to depart from the technical instrument character often associated with watches. The top disc is used to conceal the center point of the dial and to reveal the indices of the hour and minute scale only where they are needed for a precise reading. The custom winding rotor takes up the design cues from the display and acts as a moving window into the movement, revealing different parts at a time. Invented and designed by German engineer and founder of the brand Hannes Bonhoff, the Bonhoff IP3.0B is produced by renown manufacturers in Germany and Switzerland. The origin of production is stated on the case back accurate to a tenth. You may wonder why I titled this blogpost the way I did. This watch does not show time the way we are used to. You need to put some effort (use your two hands to turn the bezel) into reading time and you need to understand how it works (bring the two circles in sync and use your “brain”). 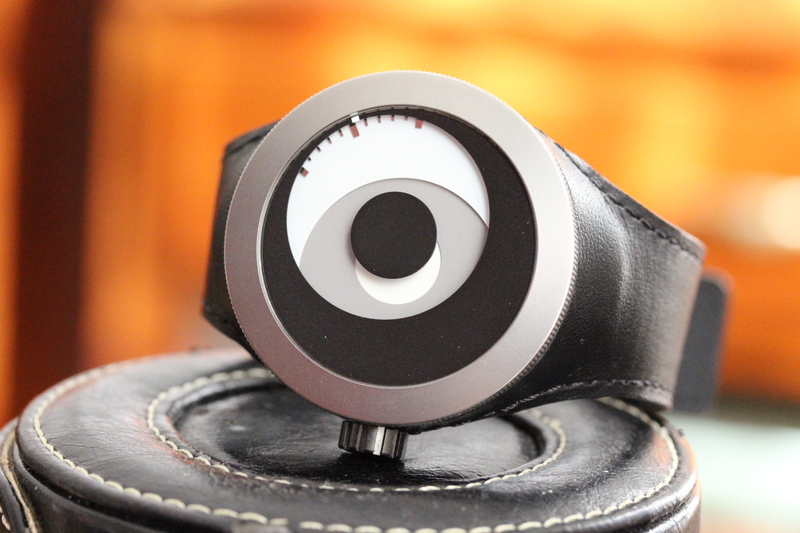 I will try to shoot a short video showing how the watch works and add it here as soon as I finish it. The first orders for this watch have come in and I will work with Hannes Bonhoff to support him and offer his watch on my sales site as soon as he can produce more pieces. Right now, he is just trying to fulfill orders. Wearing this watch was a special experience. The watch is nothing that you know. It is catching attention from people who know a lot about watches and those who know nothing about them. It catches their curiosity. This is an attention grabbing timepiece. In addition, it wears very comfortably. 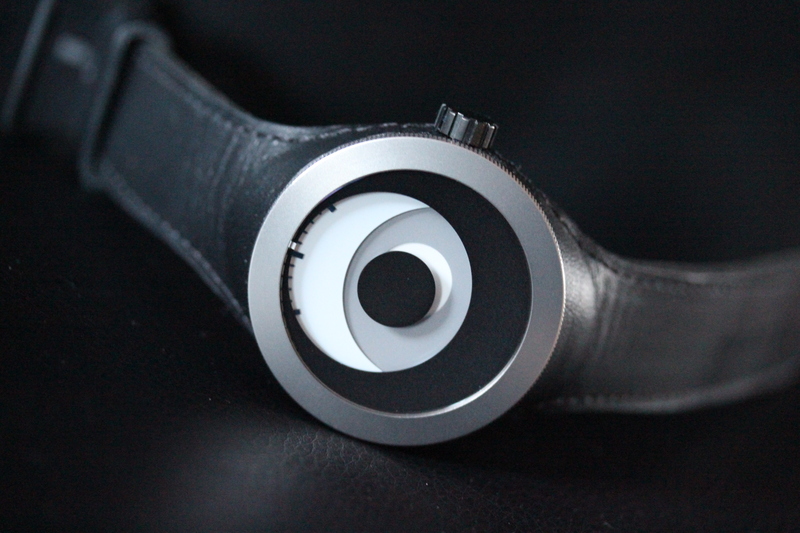 It nearly feels like you are not wearing a watch, due to the Titanium case and the integrated strap, it wraps around your wrist perfectly and is a pleasure to wear. Drawbacks are that reading time takes your attention. If you want to read time just with the blink of an eye, then this is the wrong watch. I am sure I will write again about it as Hannes Bonhoff goes along.